The Big East Tournament, once considered to be a dinosaur of yesteryear, was as exciting as it's ever been this season, culminating in a fantastic 69-67 championship victory for the Seton Hall Pirates . The Big East Tournament, once considered to be a dinosaur of yesteryear, was as exciting as it’s ever been this season, culminating in a fantastic 69-67 championship victory for the Seton Hall Pirates . Just a year ago, many were suggesting that this once mighty basketball powerhouse was doomed to fade due to the departure of teams like Syracuse, Boston College and Pitt. But here we are, still basking in the glow of a sold out championship game between Seton Hall and Villanova, a rocking atmosphere at Madison Square Garden and a one-time doormat of the conference defeating two nationally-ranked teams on its way to winning the Big East tournament for the first time in 23 years. Villanova was the odds on favorite to walk away with the tourney crown before the regular season ended, with its guard-oriented offense running opponents out of the gym. 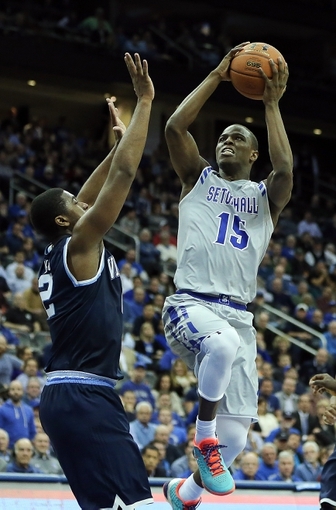 Seton Hall, on the other hand, was more of an unknown commodity, The Pirates started off 2014-15 with a bang by jumping out to a 12-2 record, but suffered a catastrophic collapse down the stretch by finishing 4-13. Not many had faith that they’d be much more than an average team within the conference this year. After losing the scintillating titlegame to Seton Hall, Villanova head coach Jay Wright addressed why the Big East will continue to thrive for years to come. Some of the best players in the New York/New Jersey metropolitan area have been leaving the area to go elsewhere over the past decade or so. The malaise of a one-time powerhouse like St. Johns is considered by some to be indicative of that trend. Big East Tournament Most Outstanding Player Isaiah Whitehead told reporters that he was glad he chose to stay close to home and not go to another power conference, as so many of his contemporaries had chosen to do. Whitehead, a Brooklyn native, was a revelation for the Pirates this season in averaging 18 points and 6 assists per game during the regular season. Although he put up steller numbers, the former star at Lincoln High School in Coney Island was barely mentioned in the national press. Unlike Whitehead, Ish Sonogo of Newark, New Jersey was not highly recruited. He expressed a great deal of humility for what he has been able to accomplish thus far in his basketball career. The fact that were even able to witness this great basketball happenstance is incredible considering Seton Hall was picked to finish near the bottom of the Big East Conference in preseason polls. I don’t think we talked about it, said Seton Hall head coach Kevin Willard. Our focus — again, when you start five sophomores and come off the bench with two freshmen and one senior, our whole focus this year was just trying to get better game by game. We talked about that after the Creighton game, after the Xavier game. We weren’t happy this morning. We talked about things we had to do better in our press offense. The Pirates led the game by 14 points late in the first half, but found themselves tied with a hard-charging Wildcats team in the second period, thanks to the hot shooting of Wildcats forward Kris Jenkins. After a series of turnovers by Seton Hall, Jenkins’ three-pointer would give Nova a three-point lead. Whitehead split a pair of free throws to cut the lead to one. Nova’s Josh Hart would turn the ball over and Seton Hall would call a timeout. Whitehead would drive hard to the basket, banking the shot off the glass for an and-one. He would hit the free throw. The Wildcats would get a good look at a three-pointer from Jenkins, but it would bounce off, leaving the final score at 69-67. Seton Hall will travel out West as a #6 seed and play against a very good Gonzaga team that was awarded a #11 seed. All things considered, Seton Hall may have gotten the short end of the stick with as low a seed as they got. The big men of the Zags will be hard pressed to match the energy of this scrappy young Pirates teams that plays like they have nothing to lose.